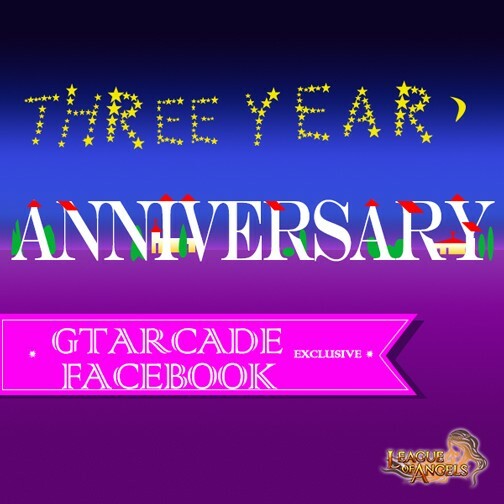 League of Angels: Special Event Lauches for Gtarcade 3rd Anniversary! Special Event Lauches for Gtarcade 3rd Anniversary! Gtarcade is grateful to all the players who have kept us company through the past three years! In celebration of Gtarcade 3rd Anniversary, Leauge of Angels has prepared a special event just for Gtarcade and Facebook, where players of the two platforms will have EXCLUSIVE USE of certain items and gain hot resources! Come and check the content below. All players on Gtarcade and Facebook are granted a Hero Bonus Card and have EXCLUSIVE use of it on Dec.13th. With this card, players will be able to get bonus rewards at a great value. Golden Queen, Styx Guardian and Blade Dancer Miya will show up at an incredibly low price! And the special event is only available on Dec.13th(server time)! You better hurry if you want to get the powerful Styx Guardian! Friendly reminder: The longer you play League of Angels on Gtarcade, the better discount you will get! Apart from the special in-game events, forum giveaways are online for all players from Gtarcade and Facebook! Join us to win awesome GIFTS! Click GO now! We hope all players will enjoy the special offer for Gtarcade 3rd anniversary in League of Angels and explore new ways to play the game!